SIZE: 3 Beds | 3.5 Baths | 2,046 Sq. Ft.
About: Residence North 11A is an approximately 2,046 square foot, 3 bedroom, 3.5 bathroom home with both East and West exposures. 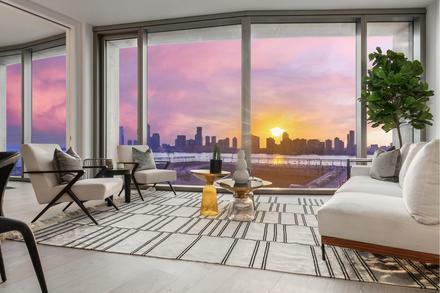 The home is flooded with natural light through 11" triple glazed and insulated floor to ceiling windows augmented with UVB/UVA protected glass that is the only thing separating you from spectacular Hudson River sunsets. 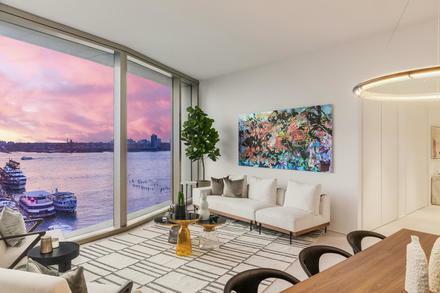 The open floor plan allows for an expansive Great Room providing the perfect atmosphere for entertaining and Scandinavian Larch wood floors run throughout enhancing the ethereal quality of the space. SIZE: 6 Bed | 7 Bath | 7,140 Sq. Ft.
About: Stately and refined inside and out lies this gated 10 +/- acre estate. Protected and secure, the entire property is fronted by a wrought-iron gate and entirely fenced-in. The home, reminiscent of Mount Vernon, sits far back on the land and is accessed by a tree-lined alley of oak trees. The dramatic landscape features a variety of specimen trees and shrubbery, dozens of hydrangea, expansive lawn, plus main house and two guest houses and a conservatory. Inside the custom-built three-story main home, which has six bedrooms and four and two half baths, guests are welcomed with a three-story spiral marble staircase and marbled foyer. The main house also features three fireplaces and a three-story dumbwaiter. One of the grounds two guest homes features full, distinctly devised living quarters with operating kitchen and the other features an open floor plan and a fireplace. SIZE: 5 Bed | 4.5 Bath | 3,200 Sq. Ft.
About: Located in a quiet East Hampton Village neighborhood, minutes to Village shopping and Ocean Beaches, is this immaculate five bedroom, four and a half bathroom Traditional. Offering open living room that seamlessly expands into gourmet chef's kitchen with stainless steel appliances and formal dining area with sonos surround sound speakers throughout. French doors connect indoor environs to the large backyard patio, heated gunite pool, and comfortable pool house. The fenced in backyard is landscape with mature planting's for ultimate privacy. The first-floor master bedroom is tucked away on its own wing with a large ensuite bathroom and plenty of closet space. The second story is comprised of three spacious guest bedroom suites and two bathrooms with walk-in showers. The finished lower level has a large guest bedroom, bathroom, and expansive media room with attached outdoor patio. This village charmer is the best of what East Hampton has to offer.